Meet the Duffster, the duffle that folds inside itself for easy storage. From compact carry pouch to full-size duffle in a matter of seconds, the Duffster is designed to keep you organized. Three zippered pockets and two exterior ones segment your belongings, while the handy carabiner holds your keys. A separate ditty bag keeps shoes, dirty clothes, or swimwear safely away from the rest of your stuff. Founder Annette Ferber was a lawyer who couldn’t find bags that could keep up with her and her four kids. She decided to design her own eco-friendly bags, and left her law practice behind. Made of durable, lightweight rip-stop polyester, the Duffster easily fits in a suitcase as a back-up bag for things you buy on vacation. Or it stores in your glove compartment just in case. This hardworking bag can hold its own—and more. 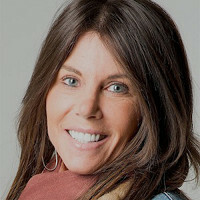 I am Annette Ferber, a mother of four kids, and I found a passion for designing shopping systems, travel bags, cross body bags, etc…after being frustrated myself without bags in the market that offer organization, function, fashion….I needed to design bags that would just be out of the box, and wow any busy consumer. It is all about function, fashion, and durability – because that is what we all need in our lives. I personally design every single unit to cater to our busy lives and they “work!" 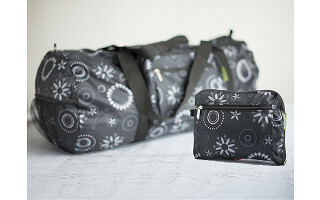 So I am thrilled that consumers have let me know how much they love using my bags for everyday and for travel. Take a look at what we offer, and let us know what you think. Nice bag, great size for 1-2 nights travel. Seems manageable when filled and on your shoulder. How much moisture can it withstand? For example, if I am travelling and get caught in a mild- to moderate rain shower, would the contents be drenched? Would it fit under the seat if I was flying? Polyester is not a material that's naturally waterproof so my inclination here is to say no, yet I'm checking with Annette now and will get back to you shortly with a definitive answer. The Duffster could likely withstand a light shower, but not sure about much more than that. Stay tuned. Thank you for your interest, I am Annette, the designer of this bag. This bag can withstand mild-to moderate rain of course! The contents would not be drenched. It is water resistant - and will protect your belongings when stuck in the rain. I travel with this bag all of the time when the airport tells me my main bag is overweight and wants me to pay a $90 fee for overweight bag. I whip this compact unit out of my purse, I quickly unzip it, put my personal belongings into it, along with whatever needed to be taken out of my overweight luggage. Saves me the fee and hassle, and yes I always do put it under my seat. The dimensions on most plaines are 20 x 17 x 11.5, and this unit when completely stuffed is 24 x 19 x 12. However, since it holds so much, i have never had to stuff it to reach the capacity, and therefore have always used it as my carry on, storing it under the seat…..
You will be very happy with this bag, it will take you everywhere and it goes a long way. Feel free to ask for any other information you may need. Enjoy! You can always find dimensions and other detailed information when you click into the box that says "buy" in orange. Below I've pasted the dimensions for you. I think when fully packed, this bag would be too big for under the seat. It would likely need to go overhead. Dimensions (collapsed): 9.5" x 1" x 8"
Duffle bag dimensions: 24" x 12" x 19"
Ditty bag dimensions: 13" x 15"
@Amy Sorry, I can't reconcile the dimensions with the photos: Looking from the short end, the bag looks to be circular, so I don't understand the 12 x 19 dimension. I'm thinking the dimension should be diameter. Can you clarify? Thanks! the dimensions when fully expanded are 24" length, x 19" height, by 12" in width ( circular at ends, where the 12" is at middle widest point. When collapsed it is 9.5" x 8" and the extra ditty bag dimensions are 13"15 with drawstring. 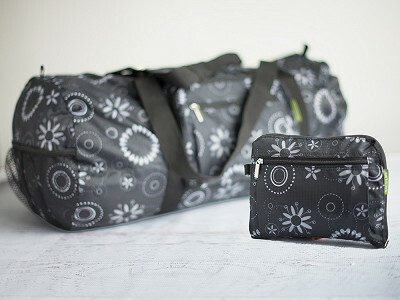 It is the perfect size for travel or everyday schlepping, and will become your "go to" bag. Feel free to ask for any more information needed and I will be happy to answer your questions. Thank you. This looks great! I am trying to get a closer look at the utility of the smaller bag on its own. I am worried I wouldn't get enough use out of that when not expanded. What could I use that for example? When you fold up the bag into itself, it essentially looks like a smaller purse or oversized clutch as you'll see in the photo. This smaller version doesn't have storage space for other things however as the inside is the stuffed bag. It does have 2 small outside pockets so if you wanted to just use those 2 pockets for a few things, you could certainly do that. Please do let me know if I'm properly answering your question. The utility of the smaller bag on its own is actually meant for putting valuables as in phone, money, credit cards, passport in the outer pocket, and the caribiner is key because it secures the unit on to anything - ie. 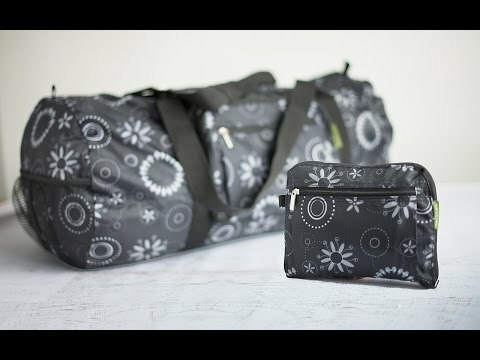 strollers, shopping carts, other bags, belt loop…it is so lightweight yet so durable, and just when you need an extra bag or two or three, this duffle, along with the ditty bag - will take you everywhere and anywhere you need to go! Meet the Duffster, the duffle that folds inside itself for easy storage. From compact carry pouch to full-size duffle in a matter of seconds, the Duffster is designed to keep you organized. Three zippered pockets and two exterior ones segment your belongings, while the handy carabiner holds your keys. A separate ditty bag keeps shoes, dirty clothes, or swimwear safely away from the rest of your stuff. Founder Annette Ferber was a lawyer who couldn’t find bags that could keep up with her and her four kids. She decided to design her own eco-friendly bags, and left her law practice behind.